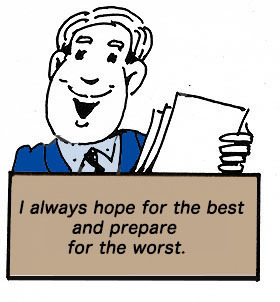 "I always hope for the best and prepare for the worst." This dictum sums up the philosophy of a very successful businessman. The philosophy involved is twofold and manifests great wisdom and balance. The first part of the dictum serves as a basis for courage in undertaking new projects. The second part preserves this man from discouragement whenever one of his projects fail. "I always hope for the best, " he says. When a new business venture is suggested to him, he takes time to think it over. He investigates the chances of success and asks the advice of many people. Then he makes a decision---either to go ahead or to forget about it. If the decision is to undertake the venture, the man does so in a spirit of great optimism. He therefore pushes ahead with confidence and courage. His optimism makes it easy for him to work hard. At the same time, this successful businessman is always prepared to accept failure. He is "prepared for the worst." Even while hoping for success, he realizes that the best planned ventures can fail. He has known many failures during his career, though no failure ever defeated him. He was always prepared. When he could do nothing to prevent failures, he gave up the project involved, and immediately turned to a new undertaking. His failures are forgotten, but his successes remain. He continues to always push ahead with optimistic courage and determination. "Always hope for the best and prepare for the worst."